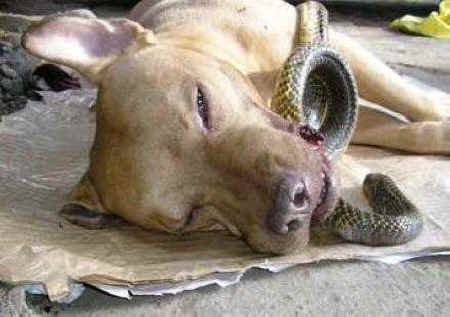 Four-year-old "Chief", an American Pit Bull Terrier, dashed in front of a venomous snake which was poised to strike at 87-year-old Liberata la Victoria and her granddaughter Maria Victoria. Shielding the women from the attack, Chief saved them but died minutes later from the snake's bite. The children in the Fronteras household referred to their dog as Kuya ("big brother"), and he certainly proved it on the day he sacrificed his life to protect the family. At around 2 p.m., "Chief", an American Pit Bull Terrier, rescued Liberata la Victoria, 87, and her granddaughter Maria Victoria Fronteras from a deadly cobra which had entered their house through an opening in the kitchen. It wasn't until Marlone arrived that Chief finally let go. Ian de la Rama describes, "Chief gave his two deep breaths and died. He was fighting and saving his last ounces of breath to see a glimpse of his master for the last two seconds of his life."